While observing last night, I observed an abnormally high hourly rate of meteors. While on a typical night, one might see about 10 per hour, I was seeing about 1 every few minutes, which I would estimate to 20-30 meteors per hour. At first I was confused, but then I remembered: the Bootid meteor shower began on June 21st! Typically considered a minor shower, the Bootids have been more active in the last few years. In 2004, they reached a peak of over 100 per hour! 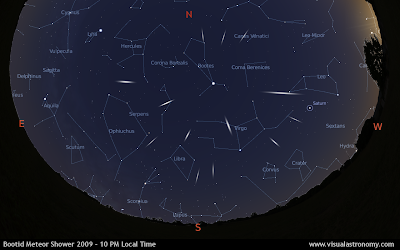 Shown above is the direction from which the meteors will appear to radiate. The Bootid meteor shower peaks on June 27th. It is believed that since the shower's parent comet, 7P/Pons-Winnecke, passed closely to Earth in 2008, that the hourly rate for this year will also be quite high. So get out and check out this meteor shower! It will go until about July 2nd, so you'll have plenty of time! That blog post is utterly implausible! Many very good tips and that are obliging in many and the additional option. Continue adding to your blog, impatient designed for a lot more elements. At present go here Cash Advance Continue the good work. Thanks for your time a great deal.